Heidi Klum's ex-husband Seal appears to be moving on splendidly. The Kiss From A Rose singer was seen getting some kissing practice of his own as he enjoyed a romantic stroll in Porto Cervo, Sardinia with a mystery blonde and his brood of children. Seal, 51, who was spotted with the same lady on Sunday aboard a luxury yacht, was on solid ground on Wednesday as he drew the slender, short-haired woman closer and gave her a tender smooch. The couple looked content as they took their time viewing the many sights of the town. Around them scampered Seal's children with the America's Got Talent host including 10-year-old daughter Leni and sons Henry, eight, and Johan, seven. Seal was dressed casually in black track trousers and black T-shirt and flip flops, a single necklace dangling from around his neck and dark shades concealing his eyes. His mystery woman sported a blunt pixie haircut and wore a navy jumpsuit, black jacket and comfy slip-on sandals, while tinted sunglasses kept the sun's glare out of her eyes. On Sunday, the pair were spotted soaking up the sun on the deck of a yacht anchored off the coast of Ponza. 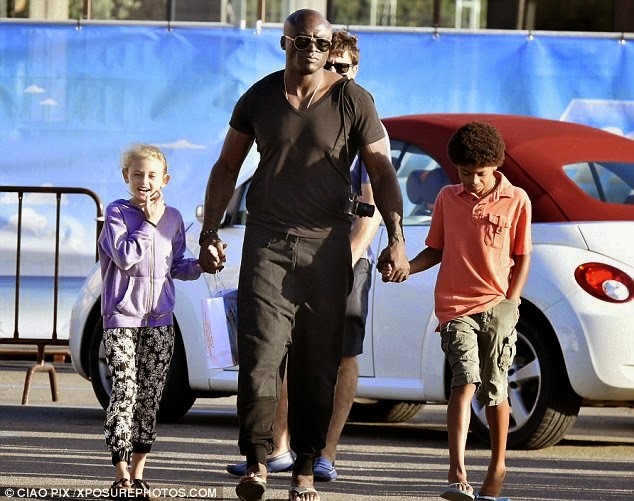 Seal's marriage to German-American supermodel Klum ended when she filed for divorce in April 2012. She went on to date the couple's bodyguard Martin Kristen that same spring, but ended that relationship as well earlier this year. Heidi has been dating younger man Vito Schnabel since February. Meanwhile, the once warring exes have come to friendlier terms in recent months.